Taking a closer look at the breast and reducing follow-up imaging by up to 40%. From the patient perspective, a 3D mammogram is a lot like a 2D mammogram. However, when it comes to evaluating the images, the differences are clear. Because the computer creates a 3D image of the breast tissue in one millimeter slices, your radiologist can view a more detailed breast image. 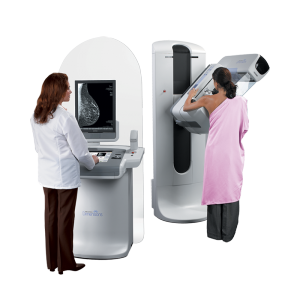 Through 3D mammography, the radiologist can better visualize your breast tissue from a screening examination. This not only improves early breast cancer detection, but it reduces the number of call backs for follow-up screenings by 20-40%. Compared to 2D or flat images of the breast, the one-millimeter slices the radiologist views in a 3D mammogram offer accuracy and detail unavailable in a flat image. One of the greatest benefits of 3D mammography is the ability to find invasive cancers sooner than with a 2D screening. In fact, the radiologists find up to 40% more invasive cancers with 3D mammography. Dr. Clanahan is the medical director of the Breast Health Center at Memorial Hospital. To learn more about mammograms, you can visit breast360.org or call Lincoln Surgical at 618.277.7400.